Now, Ubuntu 12.04 LTS has arrived with some cool new features and surprises. Different flavors of Ubuntu i.e kubuntu, Lubuntu, Edubuntu, Xubuntu, Mythbuntu etc is also available along with the primary release. If you’re using 11.10 then you can upgrade it (if you want, but recommended because the new version is an LTS release). 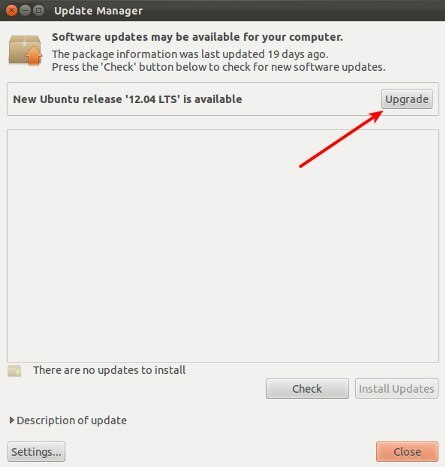 You can upgrade to Ubuntu 12.04 LTS in many ways – from terminal or update manager or you could download an ISO and upgrade using a bootable media (CD/DVD/USB). The first/second method is dead simple so we would go for that but if you’ve very slow Internet connection then it’s better to upgrading using bootable media. 0. First of all, create a backup of all your important files. It’s really important!. 2. Then check for updates. Then you would see the upgrade information about the new release. 3. Now, click on Upgrade button to continue (you will have to confirm it in a new window) and wait while upgrading process complete.